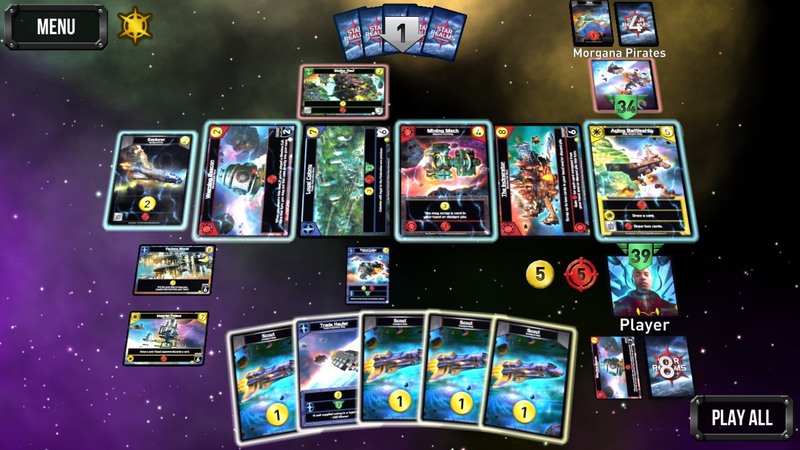 The Star Realms digital app is now available, letting users enjoy the authentic Star Realms experience on their mobile devices and home computers. The game features a variety of ways to play, including an immersive single-player campaign mode, thrilling battles against three different levels of A.I. If you are ready to step up your game after pounding on the Easy and Medium AIs, you want to play more campaign missions, or you want more cards to play with: we have you covered. Purchase the Full Version, create an account and you will be able to purchase any of the other expansions as well. A single purchase unlocks an expansion on all platforms you play. Just use the Restore Purchases function on your other devices after a purchase. Upgrade to the full version and unlock nine new campaign missions, local multiplayer, and most excitingly: a robust online multiplayer mode! The Full Version is required to purchase any other expansions. The game changes in powerful ways with a new type of card — the Gambit. When do you use them? When do you make your move? The war continues, and now the stakes are even higher! Gambit requires the Full Version. Will you outwit your opponents and claim your victory in the Colony Wars? This expansion adds 43 new cards to the trade deck and comes with two new campaign chapters. Colony Wars requires the Full Version. Harness the fortunes of war, and take advantage of the tranquility of peace. The Cosmic Gambit expansion adds 9 new gambits, as well as 15 new promo ships and bases. Cosmic Gambit requires the Full Version. All the Crisis expansions are now available for purchase. A single purchase unlocks an expansion on all platforms you play. Just use the Restore Purchases function on your other devices after a purchase. This expansion comes with all new ships and bases, adding new strategies to the game. Crisis: Bases & Battleships requires the Full Version. Events are a new type of card with potentially game changing effects when they hit the Trade Row. Crisis: Events requires the Full Version. Heroes are cards that join your cause without delay, and await your command to rally their allies and give your turn a boost. Crisis: Heroes requires the Full Version. This expansion comes with all new ships and bases, adding new strategies to the game. Crisis: Fleets & Fortresses requires the Full Version. We are currently working on the United expansions. A single purchase unlocks an expansion on all platforms you play. Just use the Restore Purchases function on your other devices after a purchase. The first expansion including all new multi-faction ships and bases – what happens when factions combine? Find out with United: Command! (requires the Full Version). 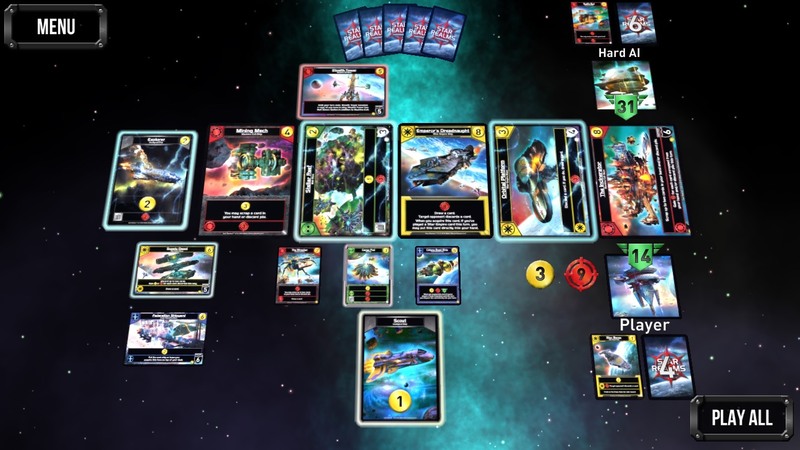 United Heroes gives us all-new Hero cards, some of which feature winners of the Star Realms Legend Series. United: Heroes requires the Full Version. The Second expansion including all new multi-faction ships and bases – what happens when factions combine? Find out with United: Assault! (requires the Full Version). Missions are an all-new card type that give players an alternate win condition. Don’t get caught off guard! United: Missions requires the Full Version. Asynchronous and Live Online Play • Awesome Sci-Fi Artwork • Deckbuilding with Player vs Player Combat • Immersive Single Player Campaign Mode • And Many More!